Here you get the CBSE Class 9 Science chapter 8, Natural Resources: Chapter Notes (Part-II). In this part you will learn about resources like Soil, water. Important biogeochemical cycles and other related topics are also covered. These notes can be really helpful while preparing for the CBSE Class 9 Science Exam 2017-2018. This article brings you the CBSE Class 9 Science notes on chapter 14 ‘Natural Resources’ (Part-II) . In previous part, of this chapter, you learned about Natural Resourcesand its types. In this some other resources and various biogeochemical cycles in nature. These chapter notes are prepared by the subject experts and cover every important topic from the chapter. At the end of the notes you can try the questions asked from the discussed set of topics. These questions will help you to track your preparation level and get a hold on the subject. Rain is formed by evaporation and condensation of water through water cycle in. Acid rain is caused by the release of the gases like SO2 (sulphur dioxide) and NO2 (nitrogen dioxide) released from the emission of vehicles and combustion of fuels. These gases dissolve in rain water to form nitric acid and sulphuric acid. It is essential for all physiological activities of plants and animals. An undesirable change in the physical, biological or chemical properties of water (due to addition for foreign organic, inorganic substances) that adversely affects the aquatic life, and makes water less fit or unfit for use, is called water pollution. It is the uppermost layer of Earth’s crust, which supports terrestrial plants, animals and microorganisms. It is formed from the weathering of rocks by physical, chemical and biological activities by the action of wind, water and sun. Humus : The decayed living organisms present in soil is called humus. Humus makes the soil porous and allows water and air to penetrate deep underground making the soil more fertile. Removal of useful components from the soil and addition of other substances, which adversely affect the fertility of the soil and kill micro-organisms living in it is called soil pollution. Fertilizers and pesticides destroy the soil structure. Mosses or Bryophytes are indicator of soil pollution. Removal of topmost layer of soil by wind, water or other activities is called soil erosion. Removal of top soil by wind (storms) and water (floods). Leaving land uncultivated for long time. Loss of fertility due to loss of topmost fertile soil which results in desertification. Clogging of water drains and water reservoirs by the washed off soil. Making strong embankments along the river banks. It was a movement started to conserve forests. The movement was led by Shri. Sunder Lal Bahuguna in Garhwal Himalayas. A constant interaction between biotic and abiotic components of the biosphere makes a system and these flow of components form a cycle called biogeochemical cycle. 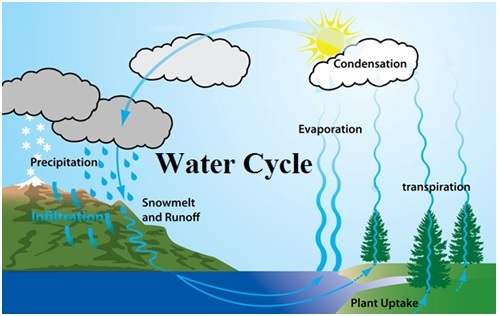 The whole process in which water evaporates and falls on the land as rain and later flows back into the sea via rivers is known as the water-cycle. a. Evaporation: Water on earth changes to vapour due to sun’s heat and rises above. b. Transpiration: Plants absorb water through the roots and then give off excess water in the form of vapor through pores in their leaves. c. Respiration: It is a process in living organisms involving the production of energy, with the intake of oxygen and the release of carbon dioxide along with water vapour. d. Precipitation: It is the process of condensation of water vapour in atmosphere into liduid which fall down in the form of rain, snow, sleet or hail. e. Percolation and Absorption: Some of the precipitation soaks into the ground to reach the underground water, some on leand gets absorbed by the plants, crops and trees to grow and the rest downhill as runoff to reach the seas to complete the whole water cycle. The sequence in which nitrogen passes from the atmosphere to the soil and organisms, and then is eventually released back into the atmosphere, is called nitrogen cycle. It is a processes by which atmospheric nitrogen is converted into the form which can be easily absorbed the organisms on earth. By lightning: When lightning occurs, the hightemperature and pressure convert nitrogen and water into nitrates and nitrites which get dissolved in water and are readily used by aquatic plants and animals. By bacteria- Molecular nitrogen is converted into nitrates and nitrites by free living bacteria or the bacteria like Rhizobium present in the root nodules of legumes. Some bacteria convert the nitrogen gas (N2) to ammonia (NH3) which plants can use. b. Nitrification: It is the process by which ammonia is converted into nitrites and nitrates. c. Ammonification: It is the process by which soil bacteria decompose dead organic matter and release ammonia into soil. d. Denitrification: It is the process by which nitrates are converted into atmospheric nitrogen back to complete the cycle. 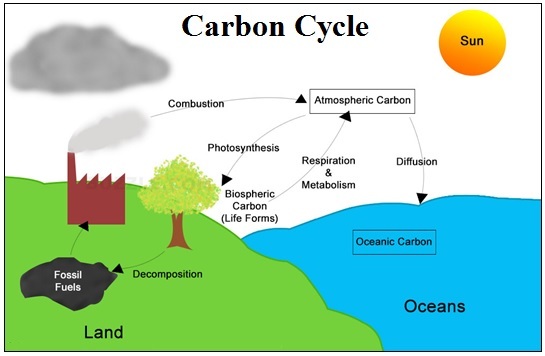 The carbon cycle is the process by which carbon moves from the atmosphere into the Earth and its organisms and then back again. a. Photosynthesis : In this process plants form their food by absorbing the atmospheric carbon in the form of carbondioxide gas and release oxygen gas. Respiration: In this process plants and animals respire resulting in breakdown of glucose stored in the plants and animals to release CO2, water and energy. Decomposition: In this process dead plants and animals get decomposed to release carbon into the environment. Combustion: Burning of fossil fuels releases carbon dioxide gas into the environment as by product. Movement of carbon from the atmosphere to the oceans: The oceans, and other water bodies, soak up about a quarter of the carbon dioxide to form carbonates. Thus, the amount of carbon –dioxide, so formed, is almost equal to the amount of carbon dioxide consumed & hence, its concentration in air remains same. 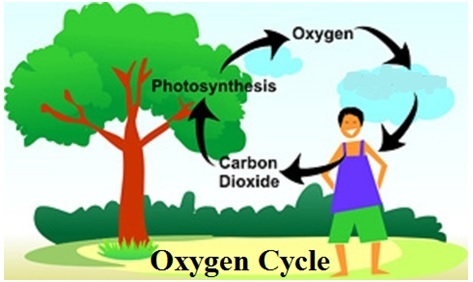 The cyclic process by which oxygen element is circulated continuously through the living and non-living components of the biosphere constitutes oxygen cycle. a. Respiration: All living organisms take in simple sugars (glucose) and oxygen and release carbon dioxide, water and energy. b. Combustion: During the processes of combustion (or burning), oxygen reacts with carbon to form carbon dioxide gas. c. Photosybthesis: Carbondioxide gas from atmosphere is absorbed by green plants in the presence of sunlight to form carbohydrates and oxygen. Thus, oxygen is liberated in atmosphere. Greenhouse gases such as carbon dioxide, methane, nitrogen oxide and Chlorofuorocarbans present in atmosphere prevents the escape of heat falling on Earth’s surface rather than absorbing it. This keeps the Earth warm and the phenomenon is known greenhouse effect. Three molecules of oxygen combine to form ozone which forms a layer in stratosphere. It acts as a protective shield as it prevents harmful ultraviolet radiations to reach the earth. Compounds like CFCs (Chloro fluorocarbons) reacts with ozone releasing molecular oxygen resulting in breakdown of ozone, which is termed as ozone depletion. Q1. Water is known as ‘A Wonder Liquid’. Explain. Q2. Why is the nitrogen cycle supposed to be an ideal cycle in the biosphere? Q3. State various steps and processes involved in the nitrogen cycle in nature. Q4. What are CFCs and how are they harmful? Q5. Mention three ways by which atmosphere regulates the average temperature on earth? Q6. List three human activities responsible for the pollution of water bodies? Q7. Name the various organisms involved in nitrogen cycle. Q8. What does the presence of smog in an area indicate ? (i) Nitrogen fixation, (ii) Nitrification, (iii) Denitrification. Q10. List any three human activities which would lead to an increase in the carbon dioxide content of air.